Transportation Student Association members were cleaning up September 30. 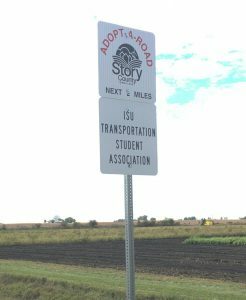 A dozen members of Iowa State University’s Transportation Student Association spent Saturday, September 30, outside on a nice early-fall day helping clean a roadway. The TSA students picked up eight large bags of trash along a Story County road near Kelley, south of Ames. TSA vice president Trevor Kirsch says the group is a member of the county’s Adopt-A-Road program. Twice a year they don hi-res safety vests and rid the roadsides of cans, food wrappers, and other small items. One student found a dollar, but nothing else stood out as memorable, Kirsch says.. The TSA is an award-winning student organization. In mid-May, TSA was awarded the Best Student Chapter award from the Missouri Valley Section (MOVITE) of the Institute of Transportation Engineers (ITE), which allowed the group to advance to the Midwestern District Competition. On May 30, the chapter was awarded Best Student Chapter in the Midwestern ITE District for its excellent programs and membership growth during the 2016-17 school year. The chapter has won the MOVITE student chapter award for each of the past five years. The Adopt-A-Road effort is one of TSA’s community service projects.